Dunbar's offers fried chicken with a side of history in its Uptown storefront home. About the restaurant: Famous for her mother's recipes, Celestine Dunbar ran a tiny, locally beloved Creole restaurant for 26 years until Hurricane Katrina filled the place with five feet of water. It took her 11 years to reopen, but open she did. 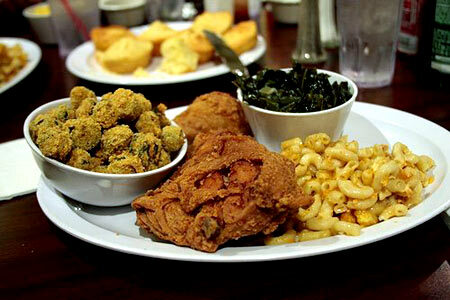 Now located in a storefront Uptown, Dunbar’s serves its famous fried chicken as well as other local Creole favorites. Dislikes: Inconsistent cuisine and service. Food & Drinks: On offer are red beans and rice, jambalaya, mac and cheese, ribs, fried catfish and gumbo, and all are accompanied by house-made cornbread. The chicken is world-class, but unfortunately some of the menu items are a bit inconsistent from one visit to the next. The same can be said for the service, although everyone is infectiously friendly. Even the new brightly lit space with yellow walls and plenty of room between tables can’t make up for overcooked okra, under-portioned seafood platters and no adult beverages. Treat yourself to a first-rate chocolate cake for dessert and you may leave feeling a bit better about Dunbar’s.